Guyi has selected high quality wild arbor sun-dried raw Pu-erh maocha, individually compressed it into teablock and avoid breaking tea leaves. Each teablock weighs about 5 grams, 20 pieces packed in a handsome box. A convenient way to enjoy Pu-erh at work or anywhere carrying loose tea or large tea cakes might be difficult. PREPARATION: To prepare Pu-erh teablock, place one in a teapot. Rinse by covering with boiling water and quickly pour off. Cover with boiling water again and let steep 5-30 seconds (depending on how light or dark you want the tea) and serve. After the first infusion the tea has just gotten started so keep on infusing. 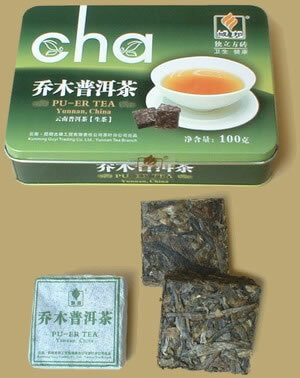 Pu-erh tea can be steeped 10-20 times.